When the weather starts to turn warm and sunny our thoughts turn to seafood. There's nothing quite like fresh New England seafood to jumpstart your summer. So with this in mind, we took the scenic route heading down to the Cape. We're very lucky to have so many clam shacks, fish houses and lobster huts, traps and pots to choose from. We even did a column on local seafood places here. Today we were headed to a place new to us, but highly recommended by friends - Lobster Pot on Cranberry Highway. This makes the third Lobster Pot we've been to (the other two being in Bristol, RI, and Provincetown) although they're all unrelated. It was a nice day, we were hungry and we couldn't wait to get there. What a cute place! Larger inside than it looks from outside, this place is a bit more than just an indoor clam shack. It has an interior loaded with comfortable seating and an outdoor eating area. There's also a fresh fish market with all your briny needs for a homemade clamboil. 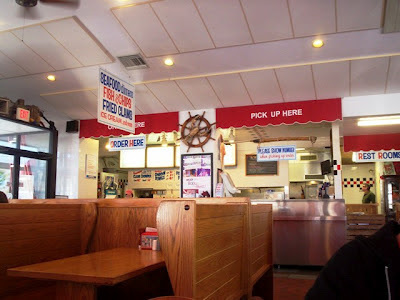 The decor is nautical with a lobster theme and red, white and blue colors throughout. There's also a large clean restroom. Now down to the food. You place your order at the counter (the whole menu is posted on the wall), pay, get your receipt with your printed order number on it and go find a seat. That's it. When your food is done, they call your number and you get your tray of goodies. As you can imagine the menu is seafood heavy. 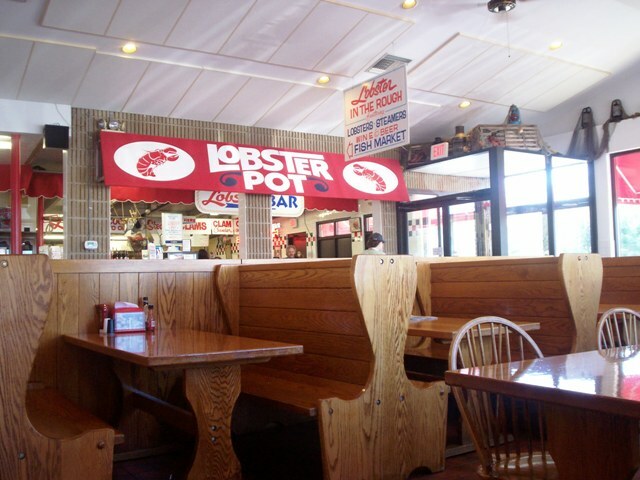 They have single lobsters, twin lobsters, shore dinners, captain's plates, steamed clams and a raw bar. Their seafood dinners consist of fish and chips, clam strips, calamari, shrimp, scallops, oysters, whole clams and assorted seafood platters. 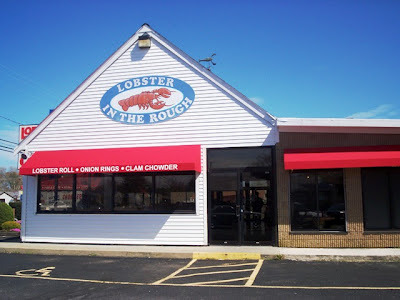 You can also get your seafood on a roll or bun with fries. If you want something not fried you can get your dinners baked or broiled. If you're lazy you can get the lazy man's lobster. And don't forget to start off your meal with New England style clam chowder or "stuffies". Don't feel like seafood today? How about a burger, cheeseburger, chicken fingers, hot dog or grilled cheese? They're all here. They even have (gasp) salads. Laura decided to have a clam strip roll with a cup of chowder. 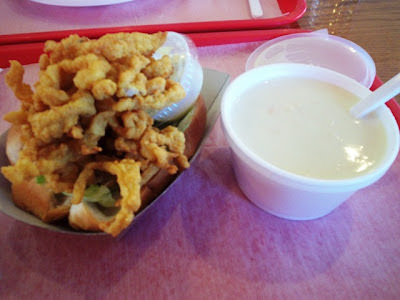 The very clean tender strips came on a buttered roll with tartar sauce and cole slaw on the side. She declared it delicious. She adored the chowder. Thick without being too thick, creamy, buttery and loaded with tender clams, she said it was one of the best chowders she'd had. Not a wonder it was voted "award winning" by Boston Chowderfest. 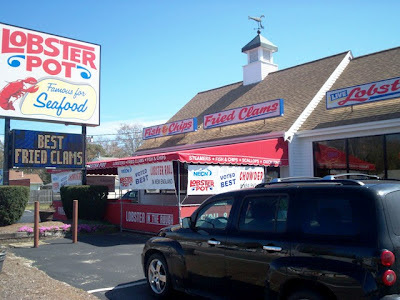 Also they've been voted New England's best lobster roll and best fried clams. I just had to try the fish and chips. It came in two sizes, which they demonstrated by hanging two different size plates on the wall. I chose the smaller and good thing I did. It was very generous. The fish was perfect, white, flaky and with a nice light crust. I hate a heavy greasy crust but this was wonderful. Even the fries were done perfectly and not greasy. 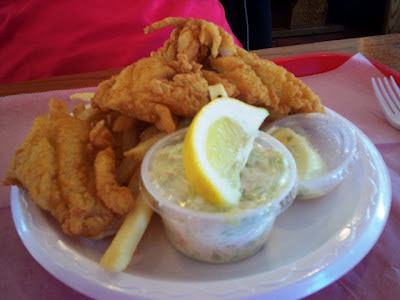 I also got tartar sauce and cole slaw on the side. I get fish and chips often and this was right up there with some of the best. I really enjoyed my meal. 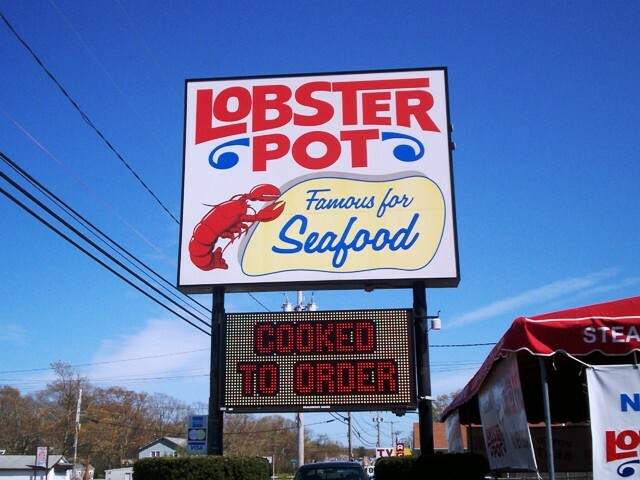 I highly recommend Lobster Pot and can't wait to go back. I suggest you take a nice ride down there yourselves. I don't think you'll be sorry. Hooray for coupons and the fact that there were no servers to tip. We served ourselves!